According to the American Heart Association, heart disease or cardiovascular diseases account for 1 in 3 deaths in the United States every year. 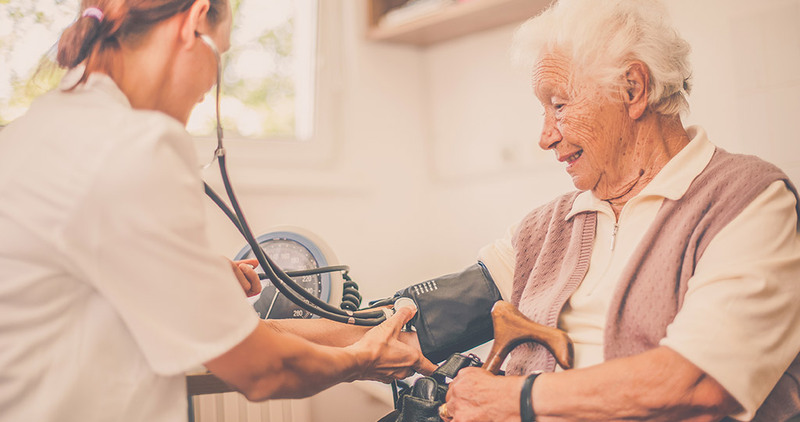 Even though the risk of heart disease increases with age, there are a lot of things seniors can do decrease their chances of experiencing heart or cardiovascular complications. February is American Heart Month and medical and professional organizations across the country are working to educate people about the importance of maintaining a heart-healthy lifestyle. While helping guide people to better choices, American Heart Month is also dedicated to warning people about the danger of heart diseases and the need for preventative action. Making heart-healthy choices can reduce the likelihood of heart attack or stroke which are often fatal or can cause permanent disability. Keeping your heart healthy as you age is possible, but it does require some additional effort on your part. Here, we present 7 heart-healthy lifestyle tips for seniors, some of which are based on Healthfinder’s American Heart Month publication. Eating healthy and balanced meals has specific benefits for the heart. Healthy eating starts with grocery shopping because the food you stock determines the food you make and eat. You should buy a variety of fruits and vegetables as they are low in calories but high in vitamins, minerals, and fiber. Whole-grain breads and cereals are high in fiber and are great choices for your daily caloric intake. Nuts are also a great source for heart-healthy nutrition. Varieties like almonds and walnuts show the most benefit and regular consumption has been shown to reduce the risk of heart disease by 50%. Exercise is a powerful means of maintaining good health. It improves brain, muscle, and heart function. Exercises for seniors don’t have to be intense – moderate exercises are equally beneficial to heart health. If you are just starting out, take it slowly and gently at first to avoid injuries or burnout. Then gradually increase the intensity as your physical energy permits. For seniors with mobility challenges, an in-home caregiver, like those provided by AmeriCare, can offer assistance in terms of researching nearby exercise options, providing transportation to exercise classes, or even helping to conduct basic exercises at home. High levels of bad cholesterol can block blood flow and lead to various heart diseases. Checking your cholesterol and eating food high in fiber are good ways of combating high cholesterol. You should avoid food containing hydrogenated oils and butter because they increase the levels of bad cholesterol in the blood. High blood pressure is common with adults, but it has no noticeable symptoms – it is also the leading cause of heart disease. Regular visits with your doctor are the best way to evaluate your blood pressure. Early detection of abnormal blood pressure will allow your doctors to help you correct it with medication and dietary guidelines. The more you weigh, the higher your risk of heart disease. If you are currently overweight, talk to your doctor about how to get your weight back to normal. Healthy foods and exercise can help you maintain a healthier weight. Excess alcohol intake contributes to high blood pressure, high cholesterol, and irregular heartbeat which are all risk factors for heart attack. Cigarette smoking is also destructive to heart health, but it is possible to quit smoking even if you have been a long-term smoker. While it may not be easy to quit, there are cigarette replacement options like patches or gums that can reduce cigarette cravings. Joining a support group or seeking medical help can also aid your efforts. Heart health is also influenced by your psychological state. Loneliness, stress, and depression are all linked to heart diseases. You can curb the effects of these issues by reaching out for support. Maintaining a good emotional connection with family, friends, and interest groups and the companionship from caregivers may also help negate the effects of stress, loneliness, or other psychological factors. Getting quality sleep can also help keep blood pressure in its normal range. Adopting heart-healthy lifestyle choices is a good pathway to a healthier heart. Start early and have a conversation about your heart health with your doctor or family members. Discuss the importance of diet, lifestyle choices, and the risk of heart diseases openly to create the best plan of action for yourself and those you love. We recommend starting the conversation by going shopping together for heart-healthy foods or taking a walk together. When it comes to heart health, every little action counts!